The flag of the Netherlands has a basic horizontal tri-band design. The significance of the flag lies within the colors chosen. The colors used in the flag of the Netherlands are based on the coat of arms of Prince William of Orange, who was a leading fighter in the freedom for the Dutch. The main difference is that the red band was originally orange in color. However, the orange dye originally used was quite unstable and would eventually turn red, leading the nation to change the official color to red. The flag of the Netherlands features a tri-band design. The top stripe of the flag is red, the middle is white, and the bottom stripe is blue. 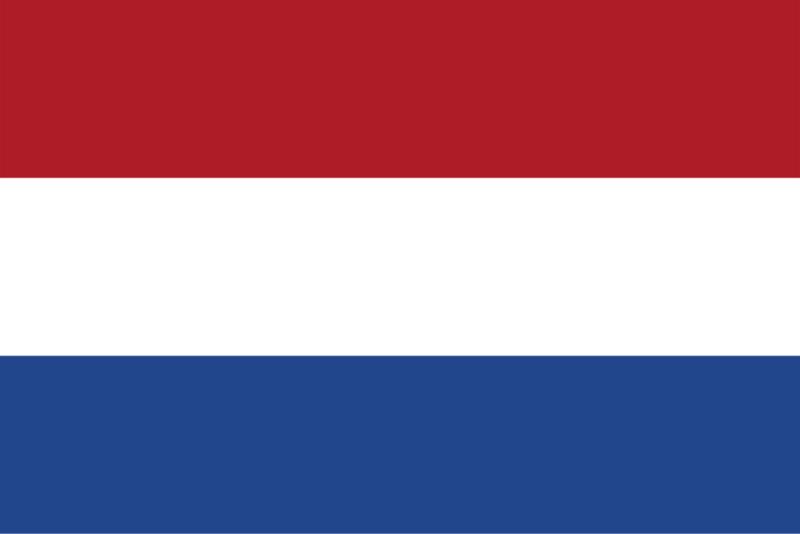 These colors are a variant of the orange, white and blue Prinsenvlag – Prince’s Flag – used throughout the Dutch Republic in the 17th century. The flag is representative of the role of William I or Orange who fought for the nation’s independence from Spain. One of the first flags used by this nation was the Cross of Burgundy Flag, which was used by provinces united under the Duke of Burgundy. This flag was used at the end of the 15th century. It wasn’t until 1572 when Prince’s Flag was used. The flag was very similar to the one used today with the exception of the orange color used for the top band. It was after 1630 when the Statenvlag was adopted, which was similar to the previous flag with the exception of changing the orange band to red. During the 18th century, the flag of the Batavian Republic went into use. This flag featured bands of red, white and blue with an emblem featuring a maiden and a lion in the upper left corner. After the nation regained independence in 1813, a new flag was put into use. It was very similar to the Statenvlag with the exception of changes to the shades used. The new flag was officially adopted as the national flag on February 19, 1937. This flag is nearly identical to the national flag of Luxembourg with the exception of a darker blue stripe and a shorter design. It is rare to find flags of the Netherlands flying at public residences outside of national holidays. On certain birthdays of members of the Royal House, an orange pennant is added to the flag. Countries in the Kingdom of the Netherlands have their own national flags.